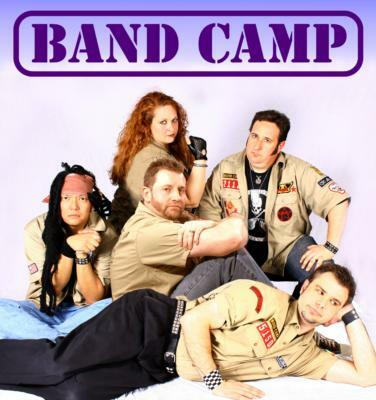 BAND CAMP is the Bay Area's campiest dance-rock party band, playing all your favorite rock n' pop hits from the '80s and beyond. 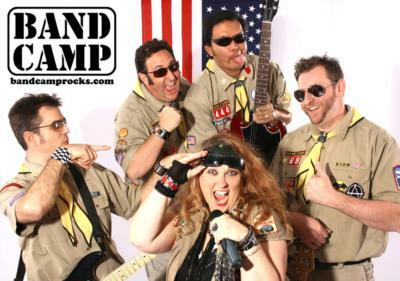 Well-known for their ability to engage audiences of all ages with their infectious energy and onstage antics, this troop of top-rate performers have all earned their merit badges in rocking out! These scouts know how to make a spark with an opening riff, and set the dance floor on fire by rubbing hits together… and every song is a crowd-pleasing sing-along. 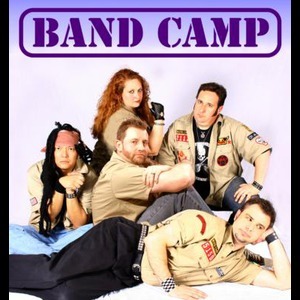 Whether it's a night out at a local club, fair, festival, corporate party, or at your own special event, you're guaranteed to be a happy camper when BAND CAMP hits the stage! Band Camp was a great addition to our wedding. Guests who I never imagined would dance at a wedding were jumping up and down and singing when Band Camp played at our wedding. I would certainly recommend them to anybody looking to let loose and have a great time. Please note Band Camp will also travel to Kenwood, Fulton, Cotati, Rohnert Park, Calistoga, Eldridge, Glen Ellen, Oakville, Rutherford, Deer Park, Camp Meeker, Penngrove, Saint Helena, Sebastopol, Windsor, Angwin, Graton, Petaluma, Forestville, Sonoma, Boyes Hot Springs, El Verano, Vineburg, Yountville, Duncans Mills, Healdsburg, Pope Valley, Bodega, Valley Ford, Guerneville.